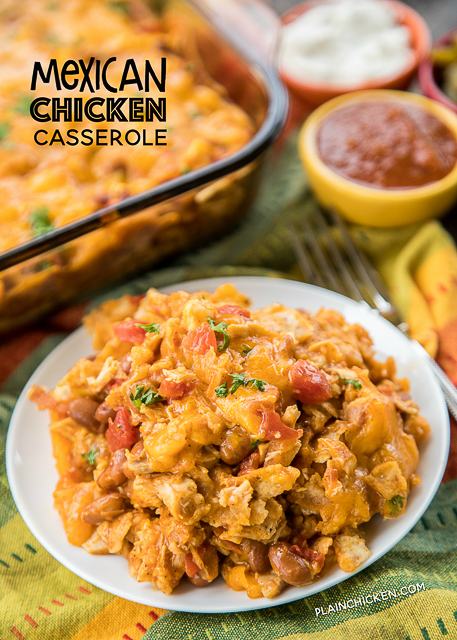 Mexican Chicken Casserole - seriously delicious! Everyone cleaned their plate - even our picky eaters!!! Chicken, tortilla chips, beans, diced tomatoes and green chiles, taco seasoning, cream of chicken soup and cheese. Can make ahead and freeze for later. We LOVE this easy casserole recipe! Anyone else love a good and easy Mexican casserole? 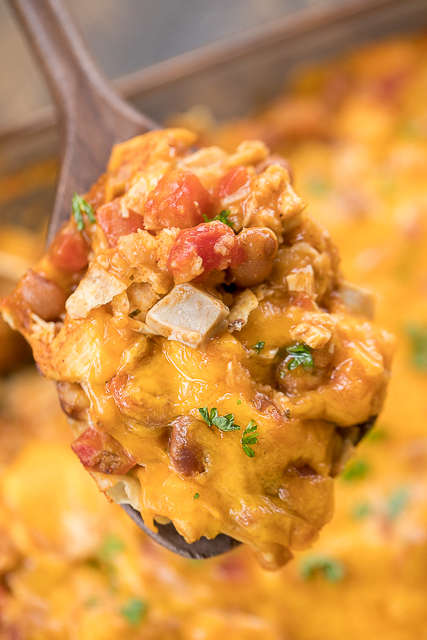 This Mexican Chicken Casserole is not only super delicious, it is super easy to throw together! It was a great change to taco night. We loved all the flavors in this dish! Chicken, beans, diced tomatoes and green chiles, taco seasoning, tortilla chips and CHEESE!!! Comfort food at its best! 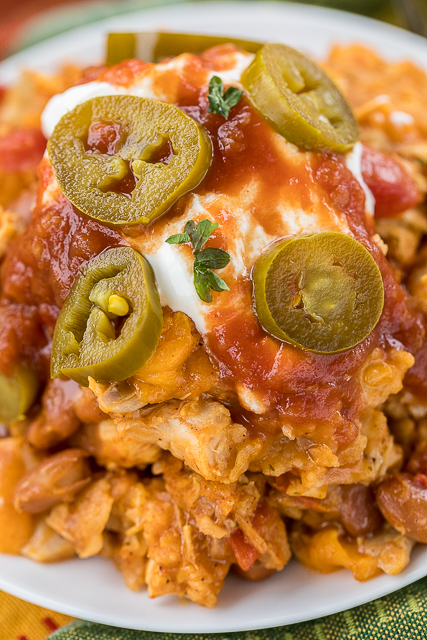 This Mexican Chicken Casserole recipe is definitely going into the regular dinner rotation. 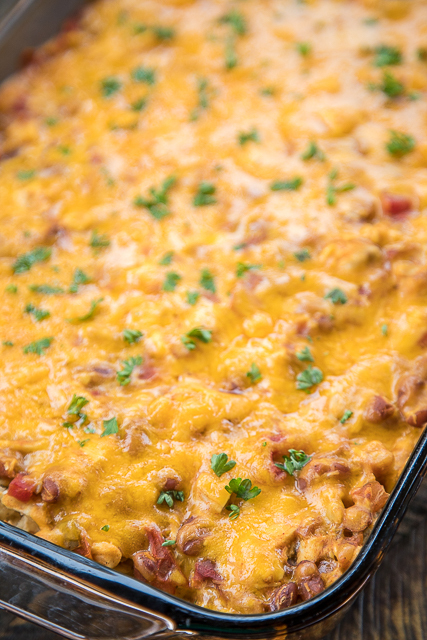 This Mexican Chicken Casserole is super easy to make. Just mix all the ingredients together and layer with tortilla chips in a lightly greased 9x13-inch baking dish. Top the casserole with cheese and you are ready to bake. I used some chopped rotisserie chicken (my secret weapon) and this was ready for the oven before it was preheated. WooHoo!! If you aren't buying rotisserie chickens at Costco or Sam's you are really missing out. They are my #1 timesaver for easy weeknight casseroles! I always have at least two pulled chickens in the freezer. There is a little kick from a can of diced tomatoes and green chiles. If you are serving this to kids, just make sure to grab a can of the mild diced tomatoes and green chiles. You could even just use a can of diced tomatoes or leave them out all together. Can I use Doritos in this Mexican Chicken Casserole? Absolutely! You can use plain tortilla chips or Doritos. I think Cool Ranch Doritos might be good in this Mexican Chicken Casserole too. I have a serious weakness for Doritos, so I will take any opportunity to add them to dinner! This Mexican Chicken Casserole is very filling. We had this for dinner and reheated for lunch the next day. Top the casserole with your favorite taco toppings - sour cream, salsa, tomatoes, olives, jalapeños. Whatever you like will work great!! Combine cooked chicken, Ranch Style Beans diced tomatoes & green chiles, onion, taco seasoning, cream of chicken soup, and water. Put down a layer of crushed tortilla chips, followed by a layer of the chicken/bean mixture, then half of the cheddar cheese. Repeat layers. Cover with foil and bake for 25-30 minutes, or until bubbly. Do the chips become soggy? I have had other casseroles that called for crushed chips and they are always so soggy. The chips weren't soggy. I mixed it up and immediately baked it. You can substitute torn strips of tortillas for the chips if you want to refrigerate it and bake it later. No soggy chips. can you add instant rice to this recipe? if so do you need additional liquid? thank you! I haven't tried adding instant rice. I would assume you would need more liquid.